FunStuf Party Place is the new “go to” family entertainment center in Fitchburg. For over 20 years, FunStuf Rentals has entertained its’ customers outdoors, now they’re expanding to bring the fun indoors! 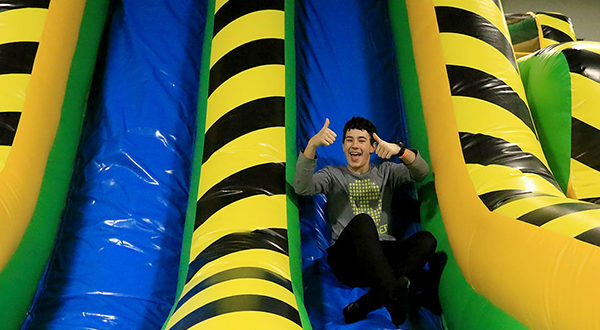 Featuring two indoor inflatable bounce arenas, arcade games and a wacky café! The nine colossal rubber attractions feature tunnels, ladders, orbs, slides and a slew of challenges for children from ages 3-14. Their indoor inflatable bounce park can accommodate any age group and any type of event: birthday parties, fundraising, field trips, recreation departments, school events, Bat/Bar Mitzvahs, college parties, and much more. Let us help you bring more FUN to your party and capture some great memories at our indoor party playground. Previous Post“American Girl Live” at Shubert Theatre running February 22-24! Next PostKid-friendly giveaways during Worcester Railers’ weekend games, see the promo schedule!